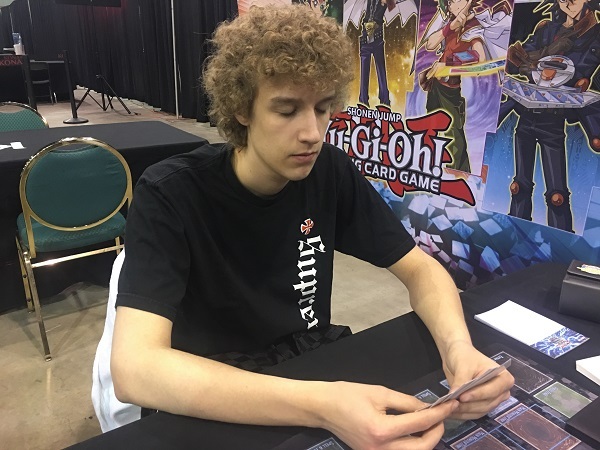 Welcome to Day 2 of YCS Chicago! There are just 2 more Swiss Rounds before the Top 32 cut, and the Duelists are seated and ready to begin! For this Round 10 Feature Match, we have Brandon Sevitz from Indianapolis with his Danger! 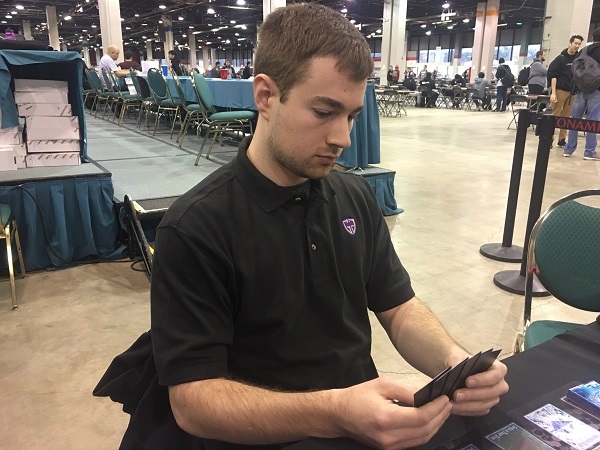 Deck Dueling against Gianpaolo Lombardi from Chicago and his Sky Striker Deck! Lombardi’s Extra Deck features 2 copies of the new Sky Striker Ace – Kaina from Savage Strike. Sevitz’s Danger! Deck is capable of explosive plays, but Lombardi’s Deck is one of the most consistent in the room. 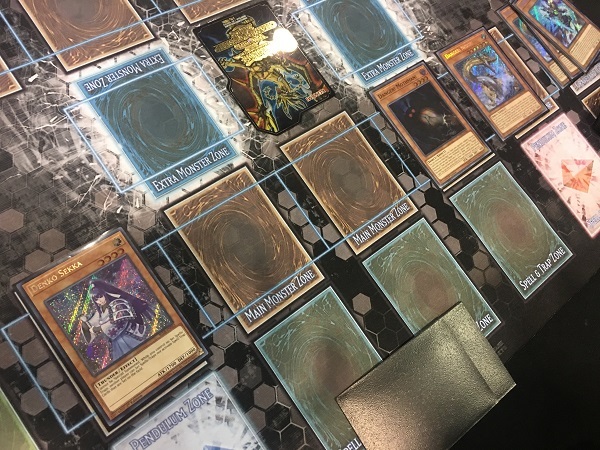 Both Duelists currently have a 7-2 record, so each of them is after a victory in this Match to keep the Top 32 dream alive. It’s time to Duel! Lombardi won the die roll and chose to go first. He Set 3 cards to his back row and ended his turn. Sevitz opened up with Danger! Response Team, Danger! Chupacabra!, Denko Sekka, 2 copies of Danger! Nessie!, and Fantastical Dragon Phantazmay. He Summoned Denko Sekka and then used the effect of Nessie. He randomly discarded Nessie from his own hand and used its effect to add Danger! Mothman! to his hand. He used another Nessie’s effect next, but this time randomly discarded the Nessie, unable to use its effect. He activated Chupacabra’s effect next, and randomly discarded it, allowing him to Special Summon Nessie from his Graveyard. He activated Mothman’s effect next, and when he randomly discarded Phantazmay, he Special Summoned Mothman and drew Broww, Huntsman of Dark World. Sevitz attacked directly with Denko Sekka, Mothman, and Nessie in his Battle Phase, dropping Lombardi down to 2900 Life Points. In Main Phase 2, he sent Nessie and Mothman to the Graveyard to Link Summon Knightmare Phoenix and discarded Danger! Response Team from his hand to destroy Lombardi’s face-down Sky Striker Mecha – Widow Anchor with its effect. He sent Denko Sekka and Phoenix to the Graveyard to Link Summon Knightmare Unicorn next, but lost out on its Summon to Solemn Strike. Lombardi dropped down to 1400 Life Points by activating it. Sevitz passed with a clear field. Lombardi Set a card and activated Sky Striker Airspace – Area Zero. He used its effect by targeting one of his face-down cards, but revealed 3 cards from the top of his Deck that weren’t Sky Strikers, missing with its effect. Sevitz Summoned Broww on his next turn, and a direct attack from Broww wiped out Lombardi’s last 1400 Life Points! Brandon Sevitz takes a quick victory against Sky Strikers in Duel 1 thanks to Denko Sekka and his Danger! monsters! Lombardi started off Duel 2 by activating Terraforming and adding Sky Striker Airspace – Area Zero to his hand. He activated Sky Striker Mecha Modules – Multirole and then Area Zero. He Summoned Raye, used Area Zero’s effect targeting Raye, and then Chained Raye’s effect to Tribute it and Special Summon Sky Striker Ace – Kaina from his Extra Deck. He added a Raye from the top of his Deck to his hand with Area Zero’s effect and then Set 2 cards to his back row. He used his Kaina as a Link Material to Summon Sky Striker Ace – Shizuku. In his End Phase, he used Shizuku’s effect to add Sky Striker Mecha – Widow Anchor to his hand and activated it, targeting Shizuku. That allowed him to Set it to his field with Multirole’s effect. Sevitz opened up with Eradicator Epidemic Virus, 2 copies of Danger! Mothman!, Allure of Darkness, Danger!? Jackalope?, and Phantom Skyblaster. 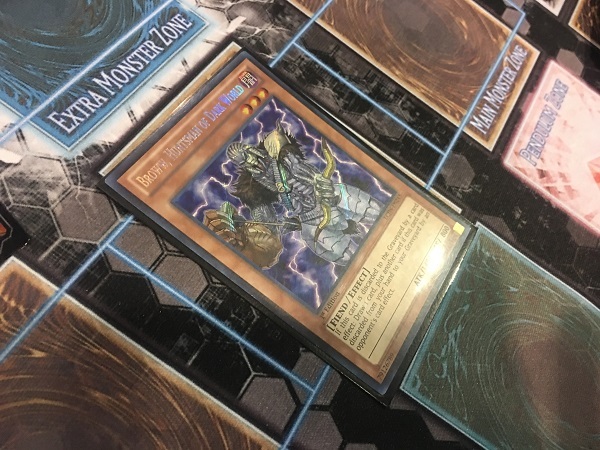 He activated Allure of Darkness to draw Phantom Skyblaster and Danger! Nessie! and then banished a Phantom Skyblaster from his hand. He Set Eradicator Epidemic Virus and then activated the effect of his Mothman. He randomly discarded Jackalope from his hand. He Special Summoned Mothman, drew Allure of Darkness, and then used Jackalope’s effect to Special Summon Danger! Bigfoot! from his Deck in Defense Position. He activated Allure of Darkness to draw Nessie and The Beginning of the End next, and banished a Nessie from his hand. He Set The Beginning of the End and then sent Mothman and Bigfoot to the Graveyard to Link Summon Knightmare Phoenix. He activated its effect by discarding Nessie, targeting Sevitz’s face-down Widow Anchor. Sevitz Chained the Widow Anchor to negate the Phoenix’s effect. Sevitz used his Nessie’s effect to add Danger! Chupacabra! from his Deck to his hand and then Normal Summoned Phantom Skyblaster. He activated its effect, but Lombardi flipped another Widow Anchor to negate its effect. Sevitz activated the effect of the Chupacabra in his hand next, and randomly discarded Mothman. He Special Summoned Chupacabra and then drew a Jackalope from his Deck. He declined to activate Mothman’s effect. Next, Sevitz combined Chupacabra with Phantom Skyblaster to Xyz Summon Outer Entity Nyarla. Then, he used Nyarla as an Xyz Material to try to Xyz Summon Outer Entity Azathot, but lost out on its Summon to Solemn Strike. Sevitz activated The Beginning of the End next, and banished 5 of his 7 DARK monsters from his Graveyard to draw 3 cards. He drew Danger! Thunderbird!, Danger!? Tsuchinoko?, and Danger! Nessie!. He activated Thunderbird’s effect in his hand and then randomly discarded Nessie. He Special Summoned Thunderbird and drew Allure of Darkness. He activated Allure of Darkness to draw a Chupacabra and a Jackalope, and chose to banish a Jackalope from his hand. Next, he activated the effect of his Tsuchinoko and randomly discarded Jackalope from his hand. He drew Danger! Response Team after Special Summoning Tsuchinoko. He activated Danger! Response Team to return Shizuku to the Extra Deck and Tsuchinoko to his hand. 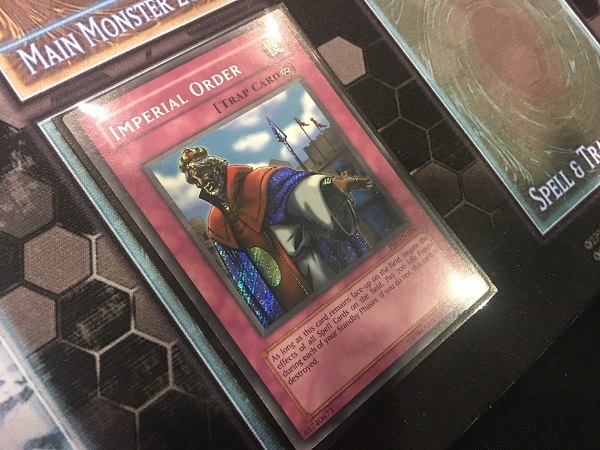 He discarded Chupacabra and returned Response Team from his Graveyard to the bottom of his Deck to draw Imperial Order. Then he used Chupacabra’s effect to Special Summon Bigfoot from his Graveyard. He Set Imperial Order and then entered his Battle Phase. 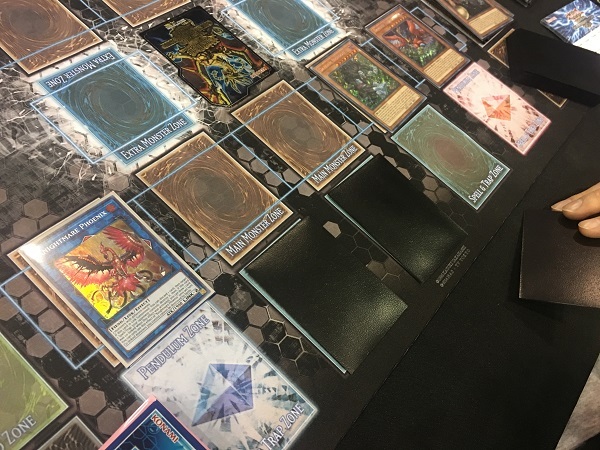 He attacked Raye with Knightmare Phoenix, and Lombardi activated Raye’s effect by Tributing it to Special Summon Sky Striker Ace – Kaina from his Extra Deck. He activated Kaina’s effect to stop Bigfoot from attacking, and the Phoenix destroyed Kaina in battle. Thunderbird attacked directly next, dropping Lombardi down to 3300 Life Points. Lombardi Set Widow Anchor to his field from his Graveyard with the effect of Sky Striker Mecha Modules – Multirole in his End Phase. Lombardi Summoned Sky Striker Ace – Raye and then used Area Zero’s effect, targeting Raye. He Chained the effect of Raye, and Sevitz Chained Imperial Order! Lombardi Chained Widow Anchor, targeting Bigfoot, and then Raye’s effect resolved. But it was all over! Lombardi conceded before deciding which monster to Special Summon with Raye’s effect. He was facing down Imperial Order and realized he wouldn’t be able to recover! Brandon Sevitz advances with an 8-2 record using his Danger! Deck!